In those days, Jesus came from Nazareth of Galilee and was baptized by John in the Jordan. And just as he was coming up out of the water, he saw the heavens torn apart and the Spirit descending like a dove on him. And a voice came from the heaven, "You are my Son, the Beloved; with you I am well pleased." The sacrament of baptism is an outward and visible sign of the grace of God. Through baptism a person is connected to Christ and joined with the universal church, the body of Christ. In baptism, God works in us the power of forgiveness, the renewal of the spirit, and the knowledge of the call to be God's people always. Baptism with water and the Holy Spirit is the sign and seal of our common discipleship and new life in Christ. Baptisms are performed during Worship on Sunday mornings. Continue reading for additional information and some frequently asked questions. Who is baptized in our denomination? All are welcome to be baptized in our tradition. 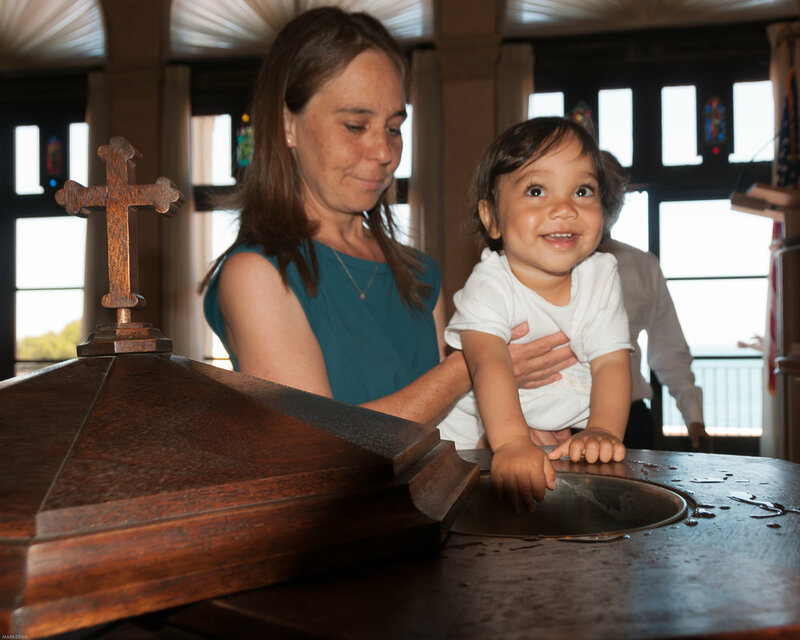 For infants and children, as well as for youth and adults who have never been baptized before, baptism marks their acceptance into the care of Christ's church, the sign and seal of God's grace and forgiveness, and the beginning of their Christian faith and life. No, one need not be a member of The Neighborhood Church. However, it is necessary to be in a relationship with the church through family or participation in worship and church life. Baptism is a personal celebration in the lives of the individual candidates and their families. It is also a celebration within the local church family and a recognition of its commitment. For this reason, baptism is celebrated in the presence of the community gathered for worship. If circumstances require baptism to take place outside of Sunday worship, arrangements may be made in consultation with the minister. In urgent circumstances, such as imminent death, baptism may be performed anytime, anywhere. Parents may choose sponsors or Godparents for infants and young children who are to be baptized. Other candidates for baptism may also be given this opportunity to have sponsors. At the time of the baptismal service, the sponsors, who accompany the candidates and present them for baptism, may make promises identical to the promises of the parents concerning their role. A brief 30 minute Baptism Interpretation session with the minister is needed to orient those being baptized and/or their parents to the deeper meaning of baptism and what it symbolizes, review the questions and promises to be made, and feel comfortable with the logistics of when the sacrament of baptism will occur in the worship service. For questions or to schedule a baptism, please contact the church office.